Data items visualization in File Manager is rather flexible, so you can easily customize it by means of redefining the corresponding templates. Thus, it's possible to specify the necessary date format, set desired icons or change an item's name presentation. icons - an array of icons. The icons are taken from the File Manager collection. Specifies how the folder/file's name will be displayed in File Manager. 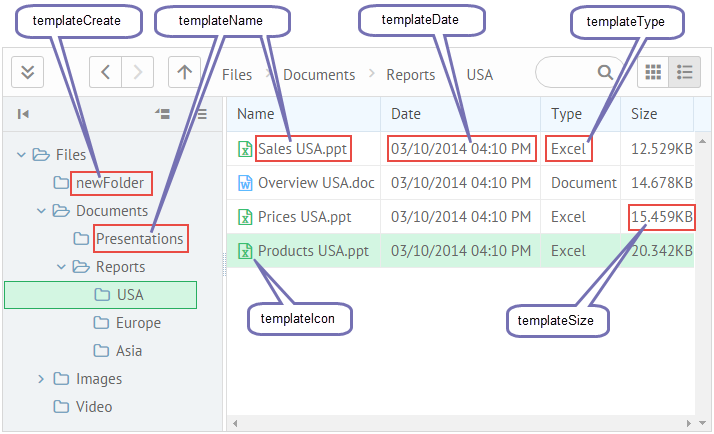 Specifies the format of folder/file's date of modification. Specifies properties for a newly created folder. Specifies the type of a file. A customizable template for icons in "Files" and "Table" view modes. return "<span class='webix_icon webix_fmanager_icon fm-"
If you have not checked yet, be sure to visit site of our main product Webix mvc library and page of html5 file manager product.